WordPress has become one of the leading and preferred content management system (CMS) in the world. The availability of various plugins on different niches on WordPress has provided an effective blogging and website platform for many online users. Plugins are usually developed to get rid of technical glitches and bugs. Due to the vast development and stable updated versions of WordPress every now and then, the requirement of essential plugins is increasing at great pace. This created a lot of space for the WordPress plugin developers to show their skills and talent. Premium WordPress Support provides you some of the suggestions to be kept in mind while developing plugins for WordPress. Generally professional developers enable WP_DEBUG to debug the codes and view error messages. Saving time is the main benefit of this code debugging in developing the plugins. Using already available framework will help you save time instead of creating and writing codes from scratch. Think globally when coding the plugins because there will be potentially a need of your plugin in different languages than only English. Utilizing community tools and templates will add fuel to your development speed rather than creating from very beginning. Promote your plugin on various WordPress forums and blogs and release the plugin only after completion. Always be perfect and confident of whatever plugin you develop to cater the future requirement of the clients regarding to your plugin. Make sure that you update the plugin as soon as the WordPress releases its updated version so that’s it can run smoothly on the new version and does not cause any problem to your clients. If you keep these simple but effective suggestions in your mind while creating your plugin, then surely you will get fame and reputation in short period of time. These practices will make you topmost and expert developer in the WordPress industry. 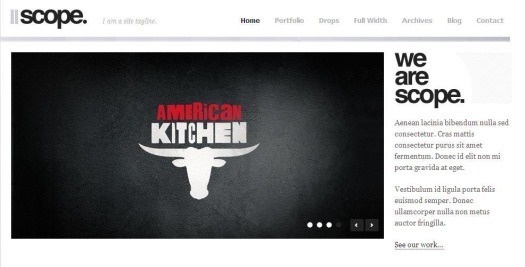 Need Help With Setting Up WordPress Pages With The Most Suitable And Premium Themes? So you have bought a new Premium WordPress theme but you need help with installing it? You have come to the right place. We offer WordPress consulting services for installing WordPress themes, WordPress plugins and more. Besides, we will also provide you information and guidance about the most suitable WordPress theme for your needs. Our other services include configuring your Permalinks (URLs generated by WordPress) to be optimized for search engines. In addition if you need support with WordPress page navigation and page structure, we provide consulting services for that too. In fact, we will personally work with you to set up the most suitable navigation for your website/ blog, one that is very user friendly. Further, we will create the structure of your page to keep your website/ blog extremely systematized. If you need spam protection, we will be glad to set up Comment Spam Prevention for your website/ blog. On the whole, we give you all the WordPress support and guidance you need to successfully run your online business via WordPress. At Premium WordPress Support, we will be happy to provide the help you with the installation and development Scope WordPress Theme . We make sure that your site’s design is unique, supreme and topmost on the global level. You can contact us anytime for the support and assistance, as we are available 24/7, 365 days a year. 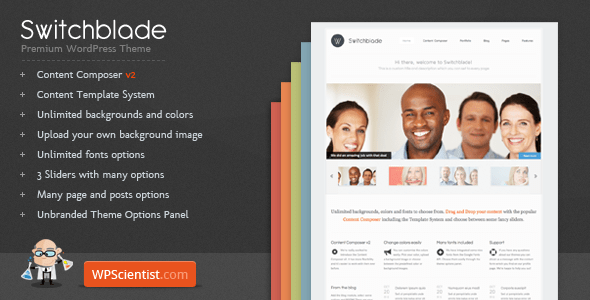 The Switchblade is one of the most recent WordPress themes available. It offers a number of features and is ideal for use in a business, portfolio or personal website. We thought we would give you a bit of information on this new theme. The theme development allows you to choose between 170 fonts for 13 new elements and has three sliders. Moreover, the background and color options on this theme are unlimited giving your greater scope for personalizing your website. You even have the option to upload your own background image. The Switchblade is compatible across browsers. When it comes to content, Switchblade scores considerably, offering 7 modules for content composer V2, including blank module, services module, portfolio module and others. So if you are looking for a theme that offers flexibility in the way you can present content and which can be personalized effectively, Switchblade is the one for you. Our professional and experienced team will install this WordPress theme for you and you can contact us for any further support and assistance in the course of using Switchblade.